'Hush Money', above, is from Mary Dunn, who died a few years ago. She lived in California and she and her husband hybridized both tall bearded irises and Louisianas on a small city lot, so small it was amazing they could produce so many beautiful irises. Her last Louisiana seedlings were introduced this year by another California hybridizer and grower. 'Hush Money' is from 1998, and represents an example of the slight bicolor of blue and yellow, first made famous by Charles Arny with 'Easter Tide' in 1979. I also grow 'Gulf Moon Glow', another example of this type. 'Hush Money' is a moderately sized flower, and shows the added beauty of a glistening surface to the blooms. 'High Rank', right, is a terrific red. It is a Mary Dunn iris from 1990. The yellow reverse, style arms and trim seem to add to the impact. It opens with brilliant colors that do mute some as the flower ages but remain attractive. Later blooms seem more a terra cotta shade. This is 'Sorbet' -- Mary Dunn 1991. There have been so many deaths of hybridizers of note recently, including Mary Dunn. We hope a new generation of breeders will emerge in this country. 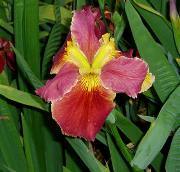 Most of the hybridizing in the United States has been done as a hobby. Taylor and the Pryors of Australia have more a commercial approach, with catalogs and listings more like some of the US commercial bearded iris growers. Heather Pryor noted that in at least one recent year, more Louisianas were registered by people outside the US than in the US. While I don't like to think of that, we appreciate beautiful plants, no matter what their source. 'Fresh Mint' is a very fine Mary Dunn iris, registered in 1994. 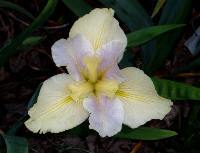 Charles Arny introduced a lilac and yellow bicolor iris named 'Easter Tide' in 1979. It was and is a beauty, but tends to be bud tender farther north. Many since have been registered and introduced to carry on this color scheme in more hardy plants. I'm not certain they are necessarily improvements, but many are very nice. The three charter member women of the Society of Louisiana Irises are Barbara Nelson, Marie Caillet and Aline Arceneaux. Aline's family were collectors and breeders of irises. The Arceneaux pond, just north of Lafayette, is a swampy area with a large number of collected and early hybrid irises. It is as close as I will ever see to the original native sites before development destroyed them. The Arceneaux's descend from the family of the lover of Evangeline -- a real story of history and romance in Louisiana. Aline kept the society roll and printed out the address labels for our newsletter, etc. mailings until this last November. dad dug for minnows. The pond and garden will be on tour for the 2004 SLI convention, among a number of gardens. She has been a leading publicist for Louisianas for years, refuting the idea that they wouldn't grow in the Texas climate. Her era extends from the early collections in the swamps through to the worldwide society membership, with hybridizing now in France, South Africa, Australia and New Zealand. A celebration of flowers occurring soon in Japan will feature Louisianas, with duplicate plantings in Rochester, NY. Marie is our treasure trove of information. We hate to think that age is forcing a decrease in her physical, but certainly not mental, activity. 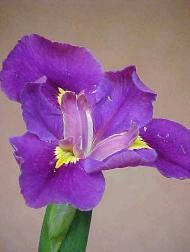 She just entered seven bloom stalks at the Dallas iris show and won Queen of the Show with an Australian iris. Now may be the time to talk about Caroline Dorman and Mary Swords Debaillon. 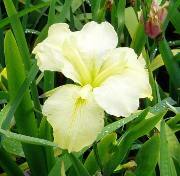 The Society for Louisiana Irises was originally named for Debaillon, a great name in the society history. 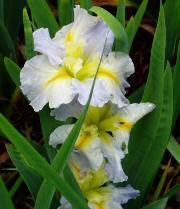 She never registered irises, but collected extensively in the Lafayette area, and including many I. nelsonii variants. After her death, Caroline Dorman, of Saline, south and east of Shreveport, grew a part of the Debaillon collection. From 1943 to 1949 Miss Dorman registered 19 of these irises under the name Debaillon-Dorman. Debaillon also distributed seed, whether planned or bee cross, toward the end of her life. From one of these seeds, MacMillan grew 'Bayou Sunset', an outstanding early hybrid, and second winner of the Debaillon award. The Debaillon medal is given yearly by the American Iris Society to the Louisiana cultivar which has won preceding honors voted by judges up through the AIS system. The medals are cast and furnished by SLI. Miss Dorman's home is maintained as a nature reserve with limited guest accommodations. 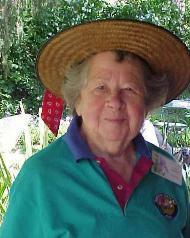 She was a talented artist and author of native plant books. Her iris paintings are unfortunately held by a museum which considers them beneath exhibition level, so they will never be seen by those trying to identify early hybrids. She worked with the Franklin Roosevelt administration in conservation projects, and made a national name for herself, a distinguished, accomplished, intrepid woman.